In the 1950's, America was obsessed with western films, so it seemed only fitting that Disney would make westerns as well. Davy Crockett was such a huge hit for Walt, both on TV and in its theatrical releases, that two other Disney westerns, The Great Locomotive Chase and Westward Ho the Wagons!, followed a similar formula and starred Fess Parker. It seemed only fitting to include him in the next Disney western film. However, even though he would share top billing with Dorothy McGuire, Fess Parker would have very little screen time. The true stars of this film were newcomers Tommy Kirk and Kevin "Moochie" Corcoran. Tommy Kirk had recently appeared as Joe Hardy in The Hardy Boys, a serial on The Mickey Mouse Club. After that, he was signed to a long term contract with Disney. A similar thing happened with Kevin Corcoran, who occasionally appeared on The Mickey Mouse Club and earned the nickname "Moochie" for the character he played in The Hardy Boys. The main difference between Old Yeller and the previous Disney westerns is that the other films had a lot of action and suspense, but little emotion. Old Yeller is almost the opposite. While there are a few suspenseful scenes, it is mostly a laid back film about a simpler time. This film is sure to strike any viewer with an emotional chord as well, as it does get very sad. Old Yeller is based on a book by Fred Gibson, which had already taken America by storm becoming a best seller, so audiences in 1957 might have already known how the book ended. But because this was a Disney film and since Disney is famous for sugar coating things, audiences didn't expect the film to have the same ending. Surprisingly, Disney's Old Yeller is faithful to the book. The film opens with a theme song reminiscent of "The Ballad of Davy Crockett." The film opens on a Texas family who's father is leaving for a few months to sell their cattle. He leaves his oldest of two sons, Travis, in charge of keeping up with the farm's chores. However, a stray dog causes them problems, but the dog proves useful when he saves Arliss from an angry bear. One day, a man comes claiming that the dog is his, but when he sees how much the dog means to the family, he lets them keep him. As he leaves, he warns him of the hydrophobia that's been affecting animals nearby. When a wolf gets onto the farm, Old Yeller fights it off to save the family. When Travis' mom realizes that the wolf had hydrophobia, he locks Old Yeller up to wait and see if the dog has it. Two weeks later, Old Yeller turns on Travis and it becomes clear that he has been infected. As a result, Travis has to put down the dog he has come to love. Travis' dad soon returns as Travis is burrying Old Yeller. Their neighbor Lisbeth brings them one of her dogs puppies which are also Old Yeller's. As Travis begins to take a liking to the new puppy, the film ends with the same song that opened the film as the puppy and the boys play. Old Yeller was released on December 25th, 1957 and was a huge success. Critics adored it and audiences flocked to see it, making Tommy Kirk and Kevin Corcoran instant stars. Since its original release, Old Yeller has become a part of American culture. To this day, it is one of the most critically acclaimed Disney films and when you mention the film to most people, they will get a little emotional. 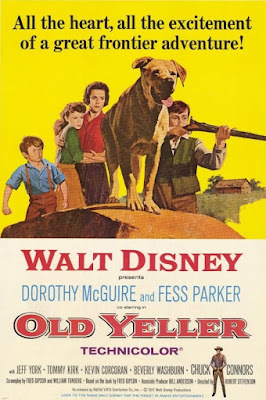 When Walt Disney decided to make Old Yeller I'm sure he knew that this would be a special film, but I doubt that he could have foreseen that this film would be popular for generations and become a part of almost every American's childhood. It was certainly a part of mine and I remember balling the first time I saw it. I've seen it about 15 times and it still brings tears to my eyes. The performances are all amazing and realistically played, including the animal actors. The film does an amazing job of making you fall in love with Old Yeller so that when Travis has to put him down, it's as if it is your dog, too. Few films are able to touch audiences in the same way and few films stay with you the way that Old Yeller does. Old Yeller is currently available on DVD paired with its sequel, Savage Sam. Both films are compressed onto the same disc. The 2-disc set includes an audio commentary for Old Yeller, a making-of documentary and a retrospective on Tommy Kirk's Disney career. The film has been fully restored and is presented in its original widescreen aspect ratio. A standalone version was released in 2002 and is now out of print, but is the recommended version because the film is less compressed and therefore looks a little better. Bonus features are identical between the two releases. It is also available on iTunes in HD widescreen, but the digital copy doesn't include any bonus features. Lovely film-yes I too get tearful every time I see it! I just adore this film! I cry at the end every single time. The book is pretty good too.